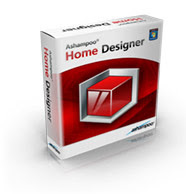 Ashampoo Home Designer is an application that comes from Ashampoo company. It is a useful software that can help you to design your home in 3D. It is a commercial software, costs $19.99 US dollars. But now we can get it for free. Very simple, just go to this page, fill your email address. It is a German version website, but easy to guess where you have to fill. After that, your will get an email with registration code. After you download and install software, you can use that code to activate it.